What Impact Would A New Korean War Have On Our Investments? Written by Jin Won Choi on Sept. 30, 2017 in Global Events. Last update on Oct. 1, 2017. At the beginning of every month, I brief members on how MoneyGeek's Regular portfolios have performed and comment on the state of the financial markets. In this update, I’ll also discuss the impact that a new Korean war may have on stocks. I've chosen to list below the performance of some of our competitors. For the sake of brevity, I've decided to show only those portfolios that have a similar risk profile to MoneyGeek's Regular Slightly Aggressive portfolio. In contrast to our competitors, MoneyGeek’s Regular portfolios employ stocks/ETFs that follow the value investing strategy (QVAL, IVAL and BRK-B), and also allocate a larger percentage of the portfolios toward Canadian oil and gas stocks (XEG.TO) and gold (CGL-C.TO). If you would like to take a look at our portfolios, I invite you to sign up for our free regular membership. The Regular portfolios outperformed their competitors in September, largely thanks to XEG.TO and QVAL. XEG.TO surged by 11.8% as oil prices recovered from the effects of Hurricane Harvey. QVAL went up by 6.3%, as its value investing strategy performed. The stock market continues to act as if there’s not a care in the world. Not only has the market continued to go up, but volatility continues to remain unusually low as well. An index called the CBOE Volatility Index (a.k.a. the “VIX”) tracks investors’ expectations of how volatile the stock market will be in the future. After spiking in August, the VIX has come back down in September, and remains at unusually low levels as of the time of this writing. You may be puzzled as to why the VIX remains so low, especially with everything that’s going on in the world. I’m puzzled too. The recent developments with North Korea in particular give me concern, and not just as a bystander who doesn’t want to see lives lost and economies ruined. I will be travelling to South Korea from Oct 1st to the 17th, so my safety and that of my family will be affected by this issue. As the trip has approached and I’ve read the news about the escalating situation, I actually seriously considered cancelling my trip. However, after talking to people and doing some research, I’ve decided to proceed. For the rest of this article, I’ll share some of what I’ve learned, and since this is an investment blog, I’ll also talk about the impact that a new Korean war may have on our investments. First, let me explain why I decided to go ahead with the trip. There are two ways that a new Korean war could start: either North Korea attacks South Korea first, or the U.S. attacks North Korea first. It’s very unlikely that North Korea would attack first. They probably know as well as anyone that launching a full out invasion into South Korea would lead to the end of their regime. Not only are the North’s weapons systems hopelessly outdated, but they also don’t have enough food to last through a major war. North Korea would need the substantial backing of China in order to have a prayer of winning a war. But those two countries have grown further and further apart in recent years, whereas China and South Korea have grown closer. China has thus signaled recently that it won’t back North Korea in a war that it initiates. So unless Kim Jong Un is insane, the only way that a war could erupt is if the U.S. invades North Korea. I won’t lie - I am genuinely concerned about this possibility, given the, ahem, unhelpful statements issued by the U.S. president and his unpredictable nature in general. Trump also has some incentives to start a war, which is to distract the public from the Russia investigation and other mess he got himself into. Fortunately, there are factors that prevent Trump from making a rash decision. First, he would need congressional authorization to start a war. Second, it would take weeks, if not months, to prepare for such an invasion. Third, there are many U.S. citizens who live in Seoul, and they would be at risk if a war started. Lastly, I would also hope that the generals who serve in Trump’s cabinet would restrain Trump from starting what would almost certainly be a very bloody war. So unless Trump makes a completely irrational decision and starts a war without authorization or preparation, I believe South Korea will be safe in the short term. The Good Judgment Project, for instance, had pegged the near term chance of a military conflict with North Korea to be very low. Should a full-fledged war erupt, however, the consequences would be unthinkable. According to a retired U.S. general, around 20,000 people could die each day in South Korea, assuming the war stays conventional. If the war goes nuclear, we’re probably looking at millions of casualties. While the human loss would be horrific, the economic loss could be devastating as well. South Korea has the eleventh biggest economy in the world, just behind that of Canada. If a war erupts, a large number of professionals will die, and a good number of factories will be damaged, which will curtail the production of goods and services. The damage to South Korea’s economy will have knock on effects on the rest of the world. In today’s economy, the supply chain to produce goods is tightly integrated across many parts of the world. For example, while Apple competes with Samsung in the market for smart phones, Apple also buys screens for its phones from Samsung. So if a war disrupts Samsung’s operations, we won’t just see fewer phones produced from Samsung - we will also see fewer phones from Apple too. A war won’t just affect phone production, either. Korea is also a large producer of vehicles, batteries, and ships, just to name a few. But it’s not just the South Korean economy that we have to worry about. North Korea has repeatedly threatened to hit Japan and parts of the U.S. as well. Now, if the war stays conventional, then I would expect the damage to Japan and the U.S. to be limited. But if North Korea fires a nuclear missile at Japan, then I don’t need to tell you how disruptive that would be. 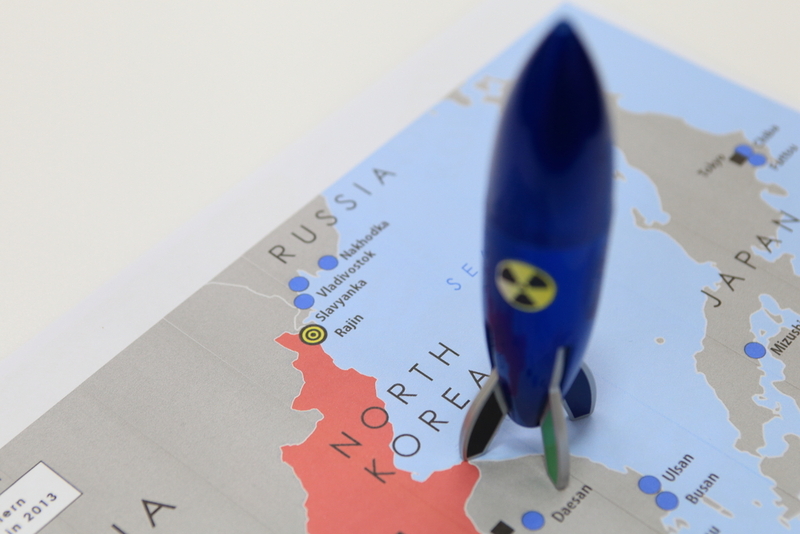 Also, while experts don’t believe North Korea has the capability of firing a nuclear missile on mainland U.S. (yet), there’s a possibility they’re wrong. Given the significant loss of life and economic damage, I would expect stocks to fall since companies’ profits will generally take a hit (but with notable exceptions, such as defence stocks). I also expect gold to go up, both because inflation will go up (fewer iPhones = higher prices) and because investors see gold as a safe haven asset. I’m uncertain as to how bonds will react. Higher inflation will be bad for bonds, but investors’ desire for safety will lift their prices. Now, some people may object to my predictions, stating that wars have not been bad for stocks in the past. In fact, wars have been good for stocks, because they have spurred the U.S. government to significantly increase spending, which stimulated the economy. Unfortunately, I don’t think we can compare wars in modern times with a new Korean war for two, or potentially three reasons. One, the scale of the war will outstrip any of the wars fought since the second world war. Two, the war will disrupt the global supply chain, which past wars didn’t affect because it either didn’t exist (during the world wars), or because the countries affected weren’t integral to it (Vietnam, Iraq). Three, while other wars were fought outside the U.S., there is a chance the U.S. itself could be affected by a nuclear missile. So while I expect the economy to benefit somewhat from increased government spending, I expect the negative economic shocks to overwhelm those benefits. All in all, it’s difficult to see any positives from a new Korean war. Despite my optimism that there won’t be a war in the near future, I’m still very concerned about what may happen down the road. North Korea seems hell bent on producing multiple nuclear warheads, along with ICBMs capable of reaching mainland U.S. Will the U.S. let that happen? I think there’s a good chance they won’t. Thus, I hope and pray that cooler heads will prevail, and that diplomacy will work.The lives of millions of people, including that of my parents and relatives, depend on it.